The Rwandan authorities have accused the man on whom the film "Hotel Rwanda" is based of funding subversion. Paul Rusesabagina became a well-known figure after the film depicted his efforts to save hundreds of Tutsis at his hotel during the genocide of 1994. Now Rwanda's top prosecutor has accused him of sending money to two former commanders of an extremist rebel group. Mr Rusesabagina has denied the accusations and says there is a smear campaign against him. Rwanda's prosecutor general, Martin Ngoga, said Mr Rusesabagina had helped to finance what he described as terrorist activities in Rwanda by funding commanders of the FDLR, or Democratic Forces for the Liberation of Rwanda. Correspondents say in recent years Mr Rusesabagina has spoken out against the government of President Paul Kagame, which has faced criticism from several quarters that it targets its political opponents. 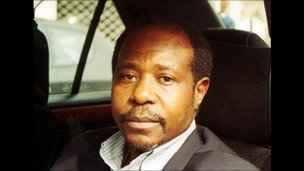 In a BBC interview, Mr Rusesabagina accused the government of launching a smear campaign against him. "It is the latest step in a campaign against me by the Rwandan government that has included public insults from the president himself, lies and physical harassment," he said.